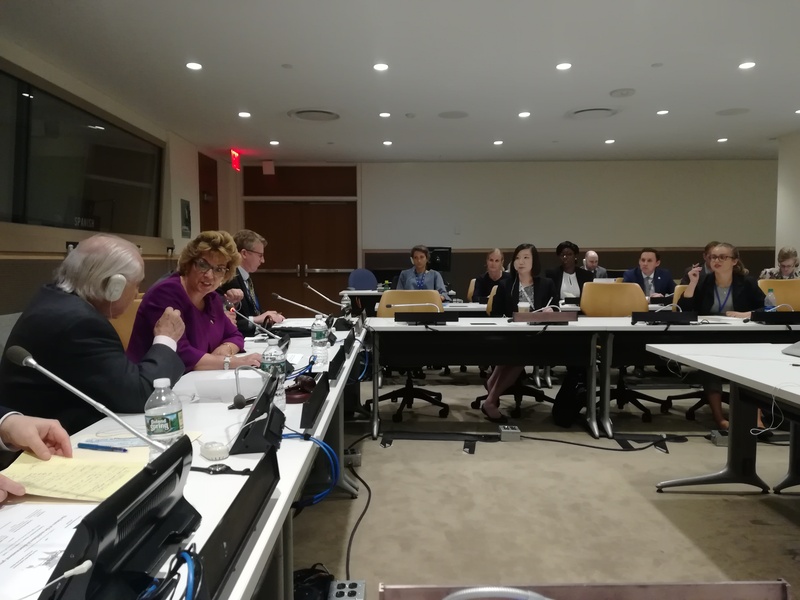 On 9 October 2018, Pugwash held a side-event during the UN General Assembly First Committee co-sponsored by the Permanent Mission of Brazil to the United Nations. More than 45 individuals from national delegations and civil society attended the discussion on “The Future of the Multilateral Nuclear Disarmament Process.” Following a welcome by the Chair, Pugwash President Sergio Duarte, and a short introduction by the Pugwash Secretary-General Paolo Cotta-Ramusino, presentations were given by Amb. Geraldine Byrne Nason, Permanent Representative of Ireland to the UN; Prof. Tom Sauer, Professor of International Relations, University of Antwerp; Amb. Thomas Graham, Jr., former US diplomat and author of The Alternate Route; and Prof. Steve Miller, Chair of the Pugwash Executive Committee. The speakers noted that the multilateral framework governing nuclear issues is considerably more fractured and under threat than even twenty years ago. The Comprehensive Test Ban Treaty (CTBT) still awaits the ratifications of those remaining Annex II countries to enter into force, although it was noted that a US ratification would create a strong incentive for the remaining States. The possibility of creating new Nuclear Weapons-Free Zones (NWFZ) remains on the table in North East Asia, South Asia, and the Middle East but such an idea for these regions highlights the important relationship that disarmament has with addressing conflict resolution. Most strongly, prospects were not considered positive for reinvigorating the Non-Proliferation Treaty (NPT) and the Conference on Disarmament (CD) with the lack of political will at this time. It was pointed out in particular that the NPT faced a serious threat if there is not tangible progress leading toward the 2020 Review Conference, and that this may create the conditions for a second consecutive failure to agree an outcome document. Indeed, the spectre was raised of States choosing to leave the NPT because of the absolute lack of progress by the Nuclear Weapons States to fulfil their Article VI obligations. Nonetheless, despite the lack of engagement by States possessing nuclear weapons with the 2017 Treaty Prohibiting Nuclear Weapons (TPNW), there was some optimism that this treaty would strengthen the norm against nuclear weapons use and possession. It was further seen as contributing to public debate within various States on the legitimacy and saliency of nuclear weapons, with evidence presented that certain private sector interests are already beginning to divest of investment in nuclear weapons-related business. Indeed, it was emphasized that, contrary to its critics, the “Ban Treaty” was complimentary and reinforcing of the existing commitments under the NPT. Although certain countries have not only spoken out against the TPNW but equally encouraged their allies not to ratify it, history shows that multilateralism can and will proceed amongst a critical mass of interested parties. In this vein, one participant expressed a confidence that, with the current rate of signatures and ratifications proceeding much as previous treaties in the nuclear realm, the TPNW could gain the magic number of 50 to achieve entry into force as soon as the end of 2019. Summed up by interventions from the audience, States must now be prepared to work beyond their own trenches and red lines in order to find new ways to forge political will and address the critical risks posed by nuclear weapons.